It’s hard to know when to broach the subject of mid-20th century radical modernist composers with your kids. My daughter was sitting quietly at age six when I decided it was time. She looked up at me with the tired patience of a child of mine. I said a man named John Cage wrote a piece of music that was nothing but four minutes and 33 seconds of silence. She was playing it perfectly. She thought for a second, then nodded. Then I told her about another piece by Cage — and this one so captured her imagination that she still mentions it ten years later. As Slow as Possible is a piece for organ. It usually runs 20-70 minutes, depending on how seriously you take the title. But if you take it literally, it raises a real question: how slow IS as slow as possible? A group of musicians and philosophers discussed that at a conference after his death, deciding in the end that the determining factor would be how long it would take before the instrument it was played on fell apart. The oldest installed pipe organ in Europe at the time was 639 years old and about to give up the ghost. The opening of As Slow as Possible. Each vertical line is a month. This project will strike some people as silly. There was a time it would have hit me that way. But the more I think about the longest piece of music, the more it moves me. The organ in Halberstadt currently playing ASLSP by John Cage. 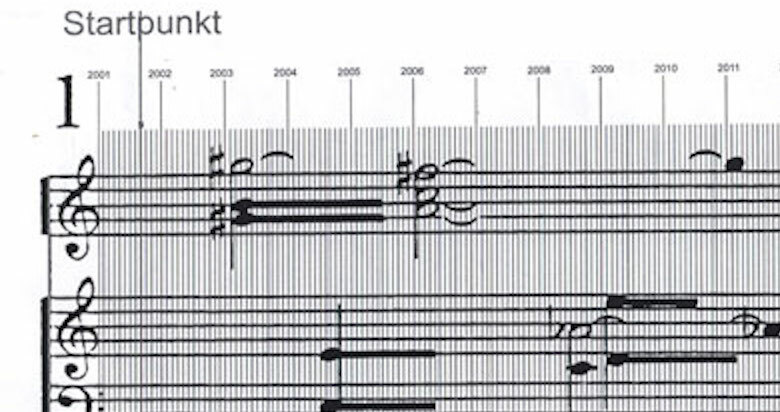 Suppose someone had started playing a piece of music in Halberstadt 639 years ago, in 1379. Only a generation had passed since the Black Death slew a third of Europe. The music would have ushered in the Renaissance, the voyages of the New World explorers, and the Scientific Revolution. The religious wars of the 16th and 17th centuries would have raged around it. It would have been playing as Halberstadt changed hands from Prussia to Napoleon’s Westphalia and back to Prussia before becoming part of Saxony, then Germany, playing as Allied bombs fell in 1945, as the town was closed into communist East Germany and as it was returned to the heart of a reunified Germany. Would that piece have reached the last note? Starting a piece of music implies an intention to finish it, so starting a 639-year long piece is an extraordinary act of optimism. It implies that we might still be here in 639 years, and that the intervening generations, with all of their own concerns and values and ordeals, will pick up the baton and run with the project we had begun, marking their calendars to visit the church and shift the weights when the time arrives. I don’t care what the music sounds like, by the way. It’s the idea that moves me, makes me think. To hear the notes currently being played is to connect yourself to the recent past and the distant future. So long as we can keep from killing each other, cooking the planet, or blowing up Halberstadt with technologies still undreamt, then maybe our optimism will have been justified. The hopeful music will finish. Meanwhile, every few years for the rest of my life, she and I will both think about this little organ playing in a church in Germany.